I always wanted a natural Textured rug for the family room. Our coaches were dark brown and I wanted to Lighten up the room this rug can in fast and it was better looking in person. I loved it. Great purchase. When it comes to indoor rugs, this hand-woven area piece is a realwinner. This lovely braided jute rug features a casual appealsuitable for living rooms, play rooms and other high-traffic areas.The rug's natural color and simple braided design is an excellentchoice for pairing with country- or rustic-themed spaces. Made in India and carrying a label that no child labor was used in the making of the rug, it's about a 1/4 inch thick and the individual coils are tightly hand stitched together. It has no tears or tufts after a month in a home with a cat. I LOVe this rug! I had been waiting to purchase a neutral, but cheerful colored natural rug for my living room and couldn't be happier. It looks beautiful. Slightly golden which matches everything, and much softer than I expected to walk on. I think it will be easy to clean. It arrived very quickly! I bought this rug on a last second switch BASED on consumer REVIEW. It was similar to another jute rug i had picked, but better reviewed. Best thing I ever did. It is lovely. I call it 'the every color you would want in blonde hair' rug. it has so many dimensions and is woven perfectly-love the quality. and jute is the best in durability. it's natural and is very easy to fit in whatever style room from contemporary, to traditional, to modern. It's fab. I had searched for the perfect area rug to compliment my new tomato red furniture. I wanted it to be braided, but wanted to avoid a bunch of colors. I also had experienced bad construction of braided rugs in the past. One day I stumbled upon this rug and amazingly, it was available in the 6x9 size that I needed. The straw color was perfect and the rectanglular shape was unique for a braided rug, so I took a chance. The rug arrived quickly and was well-wrapped. I placed it on the rug pad I had also ordered and immediately fell in love with it. It compliments my decor without detracting from the red furniture. The construction is sturdy and believe me, I checked it well. For a jute rug, it is quite soft but not so plush that it makes my room look formal. It sheds a little as expected from jute, but no more than a wool rug. Easy to vacuum and does not show dirt or lint. Great in a household with 3 dachshunds, too. I am a happy customer. This rug had so many great reviews that I decided to try it. I had bought jute rugs from West Elm and ended up giving them away because of all the shedding they did. I couldn't find a reference to shedding for this rug, but I am happy to report that I have not had any issue with it. I think this is due to the braided construction. The rug has the style of the braided rag rugs, which gives a very soft texture underfoot. I am also using it with a thin non skid pad underneath. put this rug in a high traffic dinette area, does not show dirt like plush carpets, comfortable to walk on. Can easily move chairs on it. The picture does not help much to image how the rug would look like, especially in a house. I have placed it under my dining table and it looks great. This is soft compared to other jute rugs, can walk on barefoot without a problem. The color is more of mixed shades of jute but not too dull. Like other reviewer said, it has all the colors of blonde hair. This is perfect, it is not dull in color, got light yellow-ish beiges and greyish creams all shaded over the rug, it is not one solid color, as it is the natural jute rug, it has different shades of jute. Like some other reviewer said it is tightly braided together and looks like a good quality product. Have had for couple of weeks now and didnt have the snagging problem that most rugs have especially when put under a dining table. Didnt vacuum it yet, so can't talk about it. No shedding by the way. The rug is 1/2 inch thick, thick enough to look good and hold together. I didnt put a rug pad below it, it still feels good on my ceramic tile floors. I am buying light gold valances for my dining room windows to go with the rug. This rug has been such a great purchase. If you do some price comparisons, you will find this is one of the cheapest around for it's size. The quality is excellent. 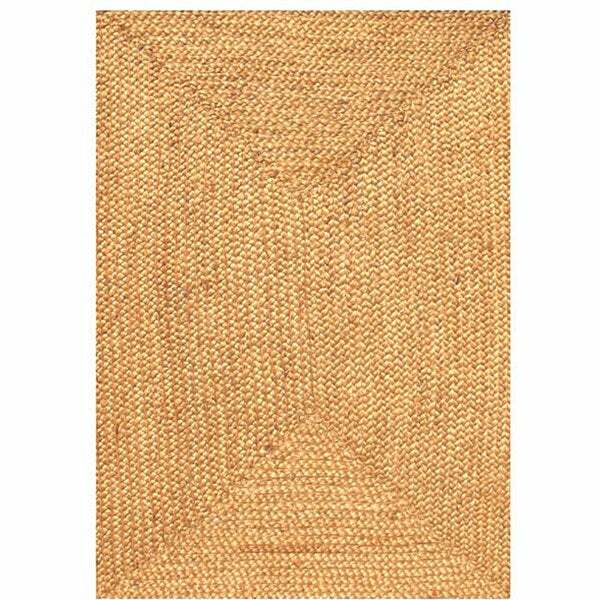 It is pretty soft for a jute rug and is great for high traffic areas in your home. The neutral color will go with any decor you are working with and the color is much nicer in person than on the site. I highly recommend if you are considering this type of rug. This rug IS just what I was hoping it would be. I ordered this rug for our master bedroom. I am so pleased with the quality and texture, as well as the color. I also ordered a felted rug pad to give it some cushion and prolong the beauty of this natural rug. I have ordered other jute rugs from Overstock and have not been disappointed. I had seen this rug several times as I was on my hunt to find just the right rug for my living room. When I saw this, I wasn't instantly drawn to it due to the color shown on the screen. After reading the reviews saying that the color was actually more on the natural side, I decided to give it a shot. It was such a great deal! I ordered it over the weekend and it was sitting at my front door when I got home this evening! It is huge! It is exactly what I was hoping it would be. It does have a slight factory-like smell, but I am hoping when it airs out, it will be just fine. My 2 year old daughter said, " Wow mom! This is awesome! ":) I then was debating if I should keep it in the living room or move it to the bedroom....then I decided to just order another one! Great buy for the money. It can pull any room together! I was going to send it back because it looked like a scratch pad for my cats. I order the UPS return label but did not return it immediatley. After looking at it for awhile I took it home and it works beautifully for my living room. I put extra cat nip on the cats scratch pad and hoping for the best! I've had it about a year now and continues to hold well in my dining room. Color was a bit lighter but is perfect with my oak hardwood floors. Love it so much I ordered another. The weave on this rug makes it a bit different and interesting. 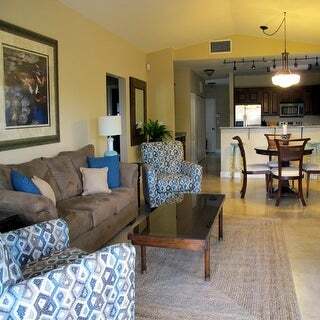 I ordered it for one of my Grand Cayman rental properties in the LR. It's holding up so well, I ordered another for another property. The price is right and the quality is decent. Sheds like a million dogs! Even though we loved the style, the jute NEVER stopped shedding for 2 years. I have no idea why we kept it as long as we did. Pure shedding torture. Do not buy this unless you like millions of little pieces of jute taking over your entire life. Nice rug but stitching gave way after approximately one year. Does not withstand much wear and tear. A nice lightweight rug but a bit difficult to clean. Perfect bedroom rug for my beach house. In fact, I bought all the various natural rugs in my beach house right from Overstock. The quality is fantastic (Safavieh, anyone?) and the prices were unbeatable. I have owned many natural fiber rugs. This is one of my favorites because the colors are variegated and the rug holds up to heavy traffic. My cat occasionally likes to use it as a scratching pad and it still has not shown any signs of wear! Beautifully crafted rug. It is perfect for indoor or outdoor decor. The fibers are soft and can be walked on or even laid on with no scratchiness or irritation. It does collect dust underneath quite easily, so be sure to lift up/move when vacuuming or cleaning underneath. Overall great purchase, highly recommend! Rug was packaged properly and was delivered in the estimated time given. It was true to color. Great for the price and my large dogs didn’t destroy it. I’m pleased with my purchase. I purchas3d two of these jute rugs, to cover the tile floor in my AZ room and they have held up beautifully, cool and warm on the tile surface. Adds some ambiance to the room, goes good with any furniture. I bought nice felt with rubber under padding for my two rugs to help with comfort and protecting the jute from wear. They vacumm well. I own a 6x9’ and a 6x4’ and use them in the same room. "Would this rug work under a desk with a rolling desk chair? Do you think it is durable enough for that? Thanks!" We do not recommend using this rug without a chair mat if you are going to be rolling a chair on it. I'd say no for rolling a chair on it- but otherwise this is a fantastic rug ! Love mine. Looks great, well made, holding up beautifully. "Can this rug be used outdoors? I wanted to place it on my patio, not under direct sunlight." It "might" work if it is a completely covered patio. Otherwise, I think the elements would make it too damp and cause mildew or dry rot very prematurely. Mine is used in the home under my kitchen table. After about 2.5 years, I chose to replace with exact rug because the traffic areas were very worn and the fibers had worked loose. I do like color and feel of the rug. "this rug looks very 'yellow' in tone in the online photo. Is it?" Hello Lesa E., we try to represent the colors of our products accurately. Unfortunately, due to the difference in monitor colors we cannot guarantee that the color will match exactly what you see on your screen. Thank you for shopping with us. it looks right for the room. "Can you spot clean this rug? I plan on using it in the kitchen over tile and know that the need for spot cleaning will arise." Yep. I've mine under my dining room table and it looks great, even with a small dog that loves using it as his place to chew his treats. I have had this rug for about 5 years and its been under my dining table (we have 5 kids). I haven't had to spot clean as it hides dirt/stains really well and vacuums nicely. The material is kind of like woven grass so I'm not sure it would do well with traditional rug cleaning/stain removal. It is reversible. "Is this rug a true 6 x 9? Often I find rugs to be shorter than their stated size..."
Hello tonycat16, this rugs dimensions are in fact 6 ft. x 9 ft. Overstock.com stands behind every product we sell. If necessary we can contact suppliers if a product issue arises. Thank you for shopping with us! Mine was very close. Actually a little over. "Does this rug come with a runner as well?" Thank you for contacting us peggy1122. It does not come with Runner. But it has a rubber backing. Please let us know if you have any further questions.